Norway’s largest bank has moved away from bricks and mortar. CFO Kjerstin Braathen is on the front lines of customer-centric change. These days, banks are not only competing with each other for market dominance. As technology transforms the global payments landscape, the distance between banks and tech companies is shrinking quickly. Norway is on the front lines. Last year both Apple Pay and Google Pay became available to Norwegian users. But these U.S.-based tech giants arrived a little late to the country’s mobile payment party. Norway’s DNB set the table three years earlier through its Vipps app, which today is used by roughly 60 percent of Norwegians. Like many other banks, DNB is relentlessly focused on evolving from a brick-and-mortar institution into a more agile, customer-centric and digitally savvy company. The strategic goal is not just to successfully contend with peer companies but to compete with tech giants like Apple and Google as well as fintech startups. To do so, the bank, which employs more than 9,000 people, closed 70 percent of its branches during the past three years while dramatically investing in digital solutions. It established a new business division focused entirely on digital banking apps and products, and has dedicated a floor of its headquarters for collaborative digital project teams. Through it all, Ms. Braathen has played a key strategic role. 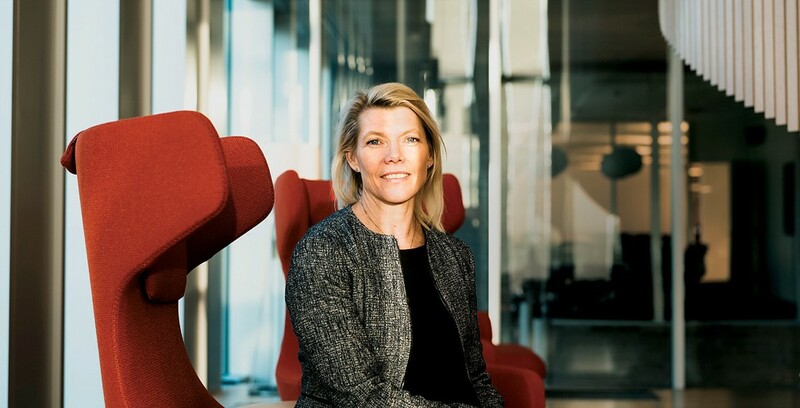 While DNB’s chief risk officer and chief compliance officer take the lead on addressing business and regulatory concerns, she is partnering with CEO Rune Bjerke to transform the bank into an agile and technology-focused firm. Mr. Bjerke invited her to join the company’s management group in 2013, and four years later she became CFO. Building her career at DNB in customer-facing roles, she says, gave her a unique perspective on delivering value and the importance of engaging all stakeholders in strategic planning and decision-making. “This role requires a very close understanding of the business,” she says. That understanding helps lead the bank into a more customer-centric and digital future—while striking the right balance between change and the status quo. She has partnered closely with Mr. Bjerke to set the strategic agenda and then talk about that agenda constantly with business unit heads to make sure everyone is aligned around it. “I’m very focused on communication,” she says. And not only internal communication. She frequently speaks with investors about DNB’s technology agenda and how the company is balancing short-term innovations with long-term strategy. Making sure that everyone—from business unit leaders to industry analysts—understands the agenda and why it is vital to the bank’s future is how Ms. Braathen intends to keep DNB at the forefront of the industry. “There are fantastic opportunities out there,” she says. But the bank can only seize them if everyone is on board and committed to acting quickly. Ms. Braathen’s biggest current obstacle relates to talent—talent management, more precisely. The challenge is more than just hiring people with the right tech skills, she says. To operate in such a fast-paced environment, the organization needs to shift how it works and how it measures success. “People in finance are used to working based on historic numbers, exact information and strict reporting lines,” she says. But when speed is of the essence, her teams frequently struggle to get all the answers and ask for permission to proceed in time. She needs them to act fast, work together and gather constant feedback from customers to iterate on their designs. That has forced Ms. Braathen to practice what she calls “let-go management,” which involves inspiring more collaboration and less bureaucracy. “In today’s world, there’s not enough time to go back and forth up through the organization to make sure at every instance you are on the right track,” she says. Being agile is about empowering people to make decisions and creating an open-door leadership style that allows her to support teams as needed rather than directing their every move. “I cannot be the one to show them exactly what they need to do,” she says. Innovative products emerge and reach market faster when supported by a collaborative environment and a flatter organizational hierarchy, says Ms. Braathen. Products that came out of that approach in recent years include Spare, DNB’s app that allows customers to access their savings, equities, mutual funds and pensions in one place. The bank has also launched a fully digital end-to-end mortgage refinancing and loan application app, which allows mobile users to apply for a mortgage on their phones and get a response in minutes. The bank is now developing similar tools for businesses to secure lines of credit and manage their finances. “These types of initiatives are possible because we have the agile way of developing,” she says. The C-suite makes sure everyone on the team knows that these smaller projects have their full backing through company-wide communications and frequent meetings between Ms. Braathen and the business leaders. This engagement from above helps overcome some of the fears about ROI on these investments. “These projects wouldn’t normally get the same bottom-up attention because they don’t have the traditional metrics related to sales,” she says. Support from the C-suite ensures they get the push they need. But a big part of boosting DNB’s agility has to do with how work gets done. Ms. Braathen pushed to reorganize key people, relocating tech teams to work within business unit, fostering communication and ensuring that everyone is focused on the same outcomes. Many of these teams operate on the “digital floor” where cross-department teams tackle strategic initiatives such as Vipps and Spare. This has changed the way teams work together. In the past, a business unit might define a product plan in business terms, then send it to the IT team on another floor for development. IT would send it to another part of the building for testing. That siloed approach wasted time and missed opportunities for innovation, Ms. Braathen says. She points to the development of Spare as an example. Going forward, Ms. Braathen plans to stay ahead of the digital future. This will involve supporting additional apps and partnering with local startups to drive innovation. In 2018, she notes, the company invested in or partnered with a series of startups focused on crowdfunding, artificial intelligence, accounting, robotics, blockchain and digital payments solutions. “We are improving our ability to use data and analytics to make better products and services for our customers, and we have quite a few exciting projects that will hit the market in 2019,” she says. DNB got into the mobile payments game early—a strategic move that has paid off. DNB got a head start on the digital competition by jumping into the budding mobile payment space back in 2015. The Norway-based bank developed its own app, called Vipps. This was a few years after some banks in neighboring Sweden launched the now-dominant Swish app in that country—but before Apple and Google had made their global mobile payment ambitions clear. Ms. Braathen and DNB CEO Rune Bjerke knew that time was short to get the app to market. They worked together to define the business goals around mobile payment and jointly agreed that it should be the firm’s top priority. “We were both on board with this being the most important thing on the agenda,” she says. That joint support from the leadership team helped them mobilize the development teams and ensure every stakeholder was focused on delivering the app to market as quickly as possible. From the beginning, Ms. Braathen and Mr. Bjerke had hoped to spin Vipps off as a separate company that it would still control. The idea was to give it the agility of a small tech company while still allowing it access to big bank finances. In early 2017, that is just what happened. More than 100 Norwegian banks took a stake in the new company, partly as a bid to block rival Nordic mobile payment apps and to fend off even bigger potential threats such as Facebook, Apple and Google. The latter two companies launched their payment apps in Norway in 2018. DNB continues to reap strategic rewards from its early push into mobile payments. “Vipps is probably the fastest-moving fintech in Europe developing from the payment space,” she says. This article appeared in the Spring 2019 issue of Insigniam Quarterly, with the headline “Banking on Agility.” To begin receiving IQ, go here.